OK, everyone, who needs a quick, no-fuss activity to keep their kids busy this Summer? Who needs 30 of those? Well, today I have one. That’s a start. I’m definitely in the boat of people who need at least 30 activity ideas though for this Summer. 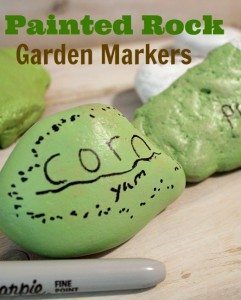 The good news is that if you have the garden that goes along with these garden markers, you can find tons of activities to keep little hands busy in there. If you don’t, why not start planting a few things now? You can even grow most things in pots if you’re short on space. 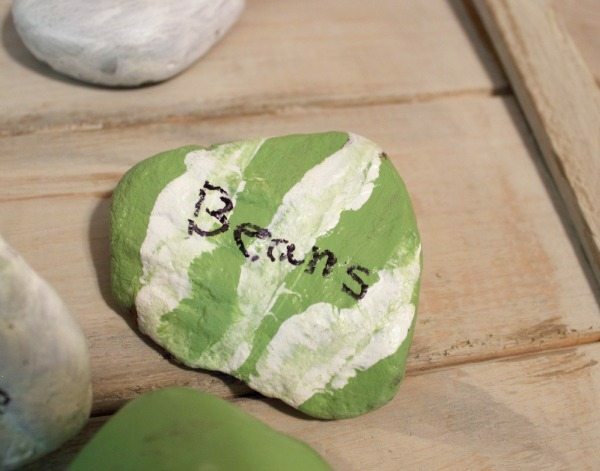 If your kids are anything like Kennedy, then you probably have a whole collection of rocks that have been collected along the way hiding out in various parts of your house. 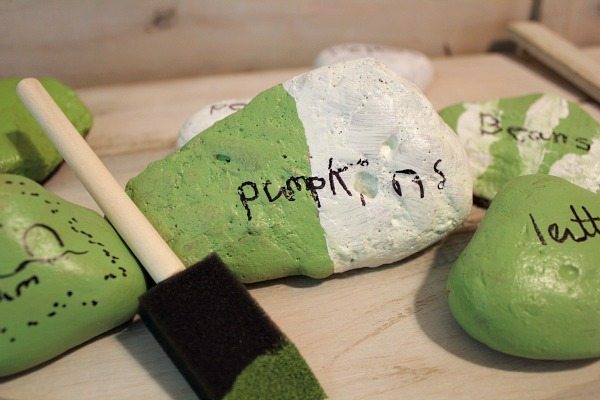 This is a great way to make them cute, put them to use, and even get them back outside again! This project was quick and fairly simple, perfect for little attention spans. 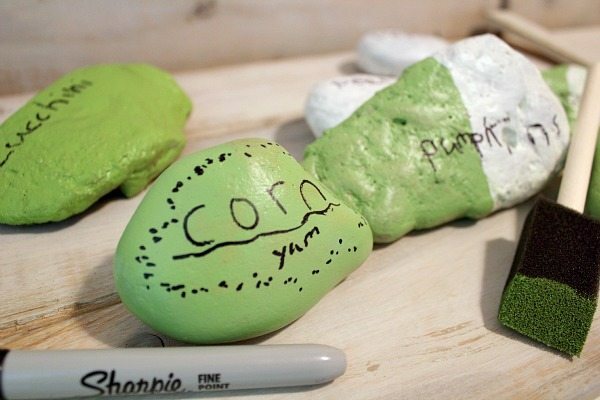 You start off by painting the rocks in your choice of color. We used Patio Paints made by DecoArt because they’re made to go outside and be weather resistant. You could always use regular paint though and cover them with some kind of a sealer too. The paint takes about 15 minutes to dry. If you want to let your kids go wild with this, but don’t want your garden to look like a rainbow threw up in it, then do what I did! Only bring out a few colors of paint for this project. That way, no matter what kind of creations your kids come up with, it will still be a look you love. I used a couple of different fresh greens, and a white. 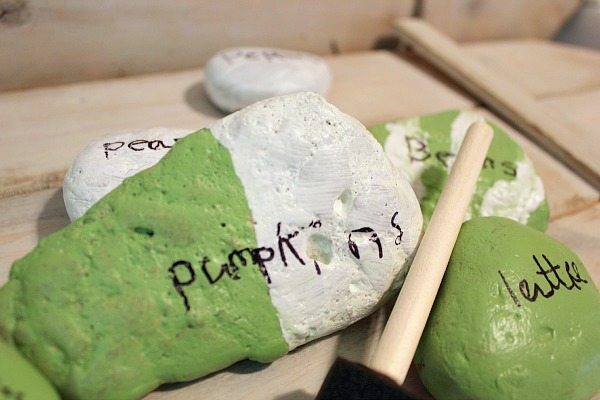 After the paint has dried, it’s time to write the names of the things you’re growing onto your rocks. If you kids are young, you can help them with this, but if they’re older it’s fun to let them do it themselves. 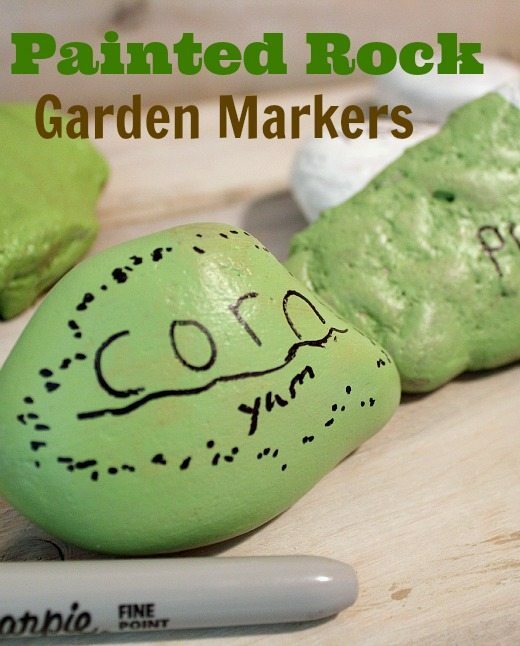 That’s really all it takes and now you’ve got some fun garden markers to use in all your gardening adventures! Best of all, it’s quick and easy, and doesn’t require a lot of planning on your part. A perfect craft to do one afternoon when you don’t know what to do with yourselves! Perfect! We have tons of rock collections here and there! Very clever. I think my favorite part of this project is your kiddo’s handwriting – that would totally make me smile while weeding the garden! Great idea to limit the number of paint colors if you don’t want your garden to be crazy but do want to give you kids some freedom! Pinned! Love em! These must look so cute in the garden. I love this idea, much better than chalk board tags I see … so practical!